As mentioned in my last post, my summer reading was dominated by Hugh Howey’s Wool Trilogy, and about a dozen books by Gail Carriger! 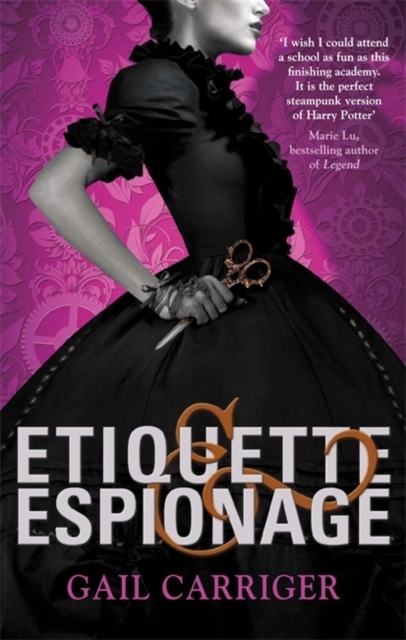 I had read Gail Carriger’s Etiquette & Espionage in July (the first in her YA series), and in August quickly blew through the rest of The Finishing School series. These books were a blast – finishing school for intelligencers (spies) in a floating, steampunk school? Awesome. It didn’t take me long to move onto the next series, The Parasol Protectorate, of which Soulless is the first (and in fact the first book published by Carriger), set about 20 years after the Finishing School Series. Synopsis: Alexia Tarabotti is labouring under a great many social tribulations. First, she has no soul. Second, she’s a spinster whose father is both Italian and dead. Third, she was rudely attacked by a vampire, breaking all standard of social etiquette. Where to go from there? From bad to worse apparently, for Alexia accidentally kills the vampire – and then the appalling Lord Maccon (loud, messy, gorgeous, and werewolf) is sent by Queen Victoria to investigate. With unexpected vampires appearing and expected vampires disappearing, everyone seems to believe Alexia responsible. Can she figure out what is actually happening to London’s high society? Or will her soulless ability to negate supernatural powers prove useful or just plain embarrassing? Finally, who is the real enemy, and do they have treacle tart? 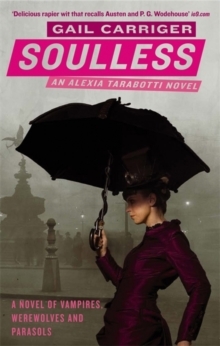 Soulless is a comedy of manners set in Victorian London: full of werewolves, vampires, dirigibles, and tea-drinking. These are whimsical books, with lots of humour and romance in them (my copy of Soulless says on the spine that it’s fantasy horror, which must solely be due to the fact that there are werewolves and vampires in it), set in the well-developed Parasolverse. It’s urban fantasy set in the Victorian era. 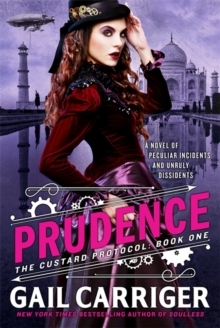 The third series is The Custard Protocol, starting with Prudence, which is set about 15 years after the final Parasol Protectorate book (what’s a girl with a dirigible to do?). Synopsis: When Prudence Alessandra Maccon Akeldama (Rue to her friends) is given an unexpected dirigible, she does what any sensible female would under similar circumstances – names it the Spotted Crumpet and floats to India in pursuit of the perfect cup of tea. But India has more than just tea on offer. Rue stumbles upon a plot involving local dissidents, a kidnapped brigadier’s wife and some awfully familiar Scottish werewolves. August and September I spent reading through everything in the Parasolverse, including the several stand-alone romance novellas featuring characters from her various other stories (mostly from the Parasol Protectorate and Custard Protocol) – the Supernatural Society Novellas are LGBTQ romances. All of the main series feature strong female protagonists, and quite often a lot of tea (they are British, after all), and I know I will be re-reading them many times to come!